We offer various types of sanitary napkins, diapers, absorbent disposable underpads and disposable adult diapers that are designed for patients of different age groups. All these products are made of specified materials and have high absorption capacities. These products are in conformation to international quality standards. 60 X 90 CMS - BAG OF SINGLE PIECE PACKING. The absorbent core is made from long pulp fibres for maximum absorbency and to allow use in all enviroments. Waterproof backing and sealted edges provide protection againest leakage. Embossed channels patterns ensure maximum dispresion of the absorped liquid and increased core strength. Available in 2 size 60x60 cm. and 60x90 cm. Pack of 1 and 10 nos. Also Available Primecare Adult Diaper in pack of 2 and 5 Nos. Colours available in blue and green. Made from A grade material. Standard quality - 500 pcs per carton. Premium Quality - 300 pcs per carton. 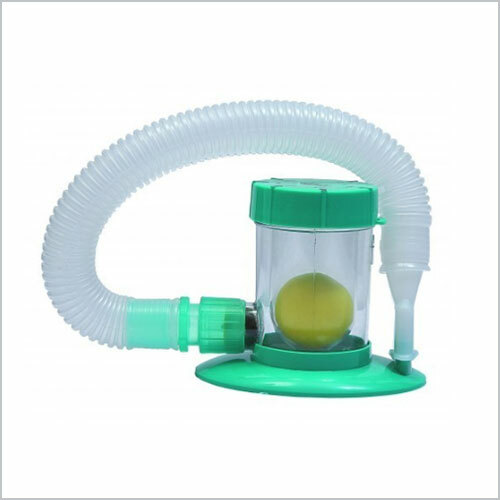 We are offering Single Ball Spirometer to our clients. Encouraging a slow, deep breathing. Inspiration equal to the flow inhaled per second. Material As for Chamber, PE for ball and mouthpiece, and EVA for tubing. Helps patient to maintain normal respiration - pre & post surgery.